Charles Johnson signs a copy of his new book, “Night Hawks,” at the Evanston Public Library on Tuesday. Johnson, who is a National Book Award winner, was born in Evanston and attended Evanston Township High School. National Book Award winner Charles Johnson came home to Evanston on Tuesday evening to speak with artist and writer Tsehaye Hebert (Communication ’86) about how growing up in the city shaped his career as a novelist, scholar and cartoonist. 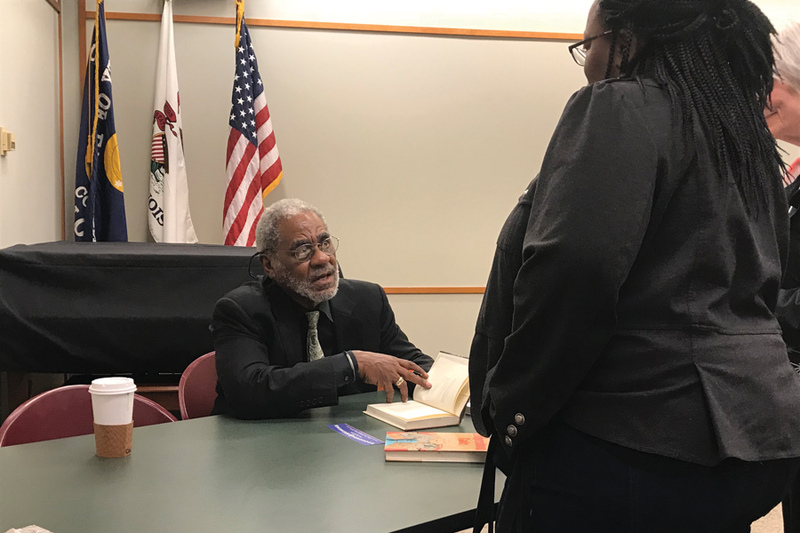 The conversation, held at Evanston Public Library, was one of more than 30 events held as part of the fourth annual Evanston Literary Festival. Johnson won a National Book Award for his novel “Middle Passage” in 1990, and released his latest book, “Night Hawks,” earlier this month. The new book is a collection of stories he wrote over the last 13 years. Johnson, now 70, was born in Evanston and attended Evanston Township High School. He lives in Seattle where he is a professor emeritus at the University of Washington. Hebert met Johnson when she helped Pegasus Theatre in Chicago adapt Johnson’s novel, “Middle Passage,” into a play. Both used to study at EPL, and during their return on Tuesday, they shared memories that occasionally brought tears to their eyes. He wrote a letter to Parade cartoon editor Lawrence Lariar recounting what his father said, and Lariar said his father was wrong. Under Lariar’s mentorship, Johnson went on to publish 1,000 cartoons and illustrations over the next seven years. After high school, Johnson attended Southern Illinois University, where he hosted a PBS series called “Charlie’s Pad” to teach viewers around the nation and Canada how to draw. Even though his father — who only had a fifth grade education — never understood Johnson’s passion for art, he paid for the lessons with Lariar. Johnson said he wants his books to change someone’s life, and, based off audience comments at EPL on Tuesday, he has. Hebert said her 12-year-old son slept with Johnson’s novel “Middle Passage” in his bed for three consecutive nights. The story is about a freed slave who runs away to New Orleans and mistakenly boards a ship that is headed to Africa to capture more slaves. When Hebert asked her son why he liked the book, he said he saw himself in it. “This is the first book I’ve ever read about a young black man,” Hebert’s son told her. While Johnson said it hurt to write about slavery, he wanted to write an adventure story for young black readers. He is now working with producers to adapt the novel into a movie. Jeff Rice, a lecturer in African studies at Northwestern, is friends with Johnson and said he admires Johnson’s ability to meld philosophy, political ideas and history in his novels.